We are incredibly excited to announce our newly remodeled Reston Location! We are now seeing patients in Fairfax & Reston. The Center for Cranial and Spinal Surgery is one of the most experienced spinal surgery practices in the Northern Virginia area. Our board certified surgeon has devoted years to the study and treatment of all types of neurosurgical conditions, specializing in the spine. Dr. Donald G. Hope is supported by a team of highly trained staff who are committed to delivering exceptional care for his patients. The Center for Cranial and Spinal Surgery is recognized as one of the best neurosurgery practices in the Mid-Atlantic region. With a commitment to staying apprised of all neurosurgical advancements and palliative care for the spine, Dr. Hope and his staff are renowned for providing meaningful advice and prudent solutions for those suffering from pain and discomfort. Doctors, physical therapists and physiatrists refer their patients to the Center for Cranial and Spinal Surgery because they know that our approach puts the patient's needs first. Dr. Hope only recommends surgery after all other reasonable treatments have been exhausted. His primary goal is to get you back to living your life, without pain and limitations. The staff at the Center for Cranial and Spinal Surgery are patient-centric. As a small practice, when you call our office during normal business hours, you will speak with a real person, not an answering service. More importantly, you'll speak with someone who has access to the answers you're seeking who is committed to your health. After 30 years in practice, Dr. Hope's patients have expressed their appreciation for his surgical expertise, his approach, and for his commitment to their health. If you're one of Dr. Hope's patients, we encourage you to share your experience so others may learn from your feedback. In preparation for your surgery, you may have several questions. There are specific guidelines you must follow and lab tests that will be required before you may undergo surgery. Click to learn more about pre-operative preparation. Patients who are pre-surgery and those post-surgery will benefit from our post-operative guidelines. If you have any questions, please call our office at any time to speak with a nurse. If Dr. Hope has recommended surgery and you are interested in scheduling your surgery, our Surgical Coordinator can help walk you through the process and answer any questions you may have about insurance pre-certification and necessary lab testing. 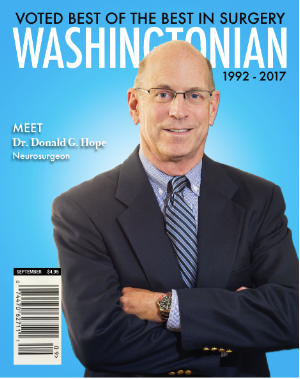 This year Dr. Donald Hope celebrates being a practicing neurosurgeon for over 30 years. Read this blog to hear about the lessons he's learned along the course of his career.